Friday was tough. Easily the toughest race I’ve ever had to win. It started off smooth with a good heat race run which lined us up 8th in the feature. The green flag droppped and we sailed around the top of 1 and 2 and passed 5 cars and were already 3rd by the back stretch. Unfortunately, a yellow came out and brought it all back. Then things got interesting. Everyone learned from my first lap. They moved up and took my lane away. Instead of being 3rd, I got stuck behind some cars and fell to 11th. The track was limited to either the very top or very bottom of 1&2 and only the very edge of 3&4. No other options to run anywhere. I was forced to file into line to follow some drivers and wait until a mistake was made. 2 drivers went over the hill and allowed me to start ringing around the top in open air. By this time, it was lap 14 and I had just worked my way into 4th. I didn’t know where I was at the time or how many laps I had left but I knew the next position car was already a straightaway ahead. I drove as hard as I could and worked on hitting my marks every lap and ran down 3rd by lap 19. It was at this point when I saw the leader and 2nd place right in front of him. We were all dicing in and out of lap traffic, avoiding contact and fighting for spots. 2nd place dropped back to 4th and I moved into 3rd. On lap 21, I hit the bottom line perfect and shot past both 1st and 2nd for the lead. I had to fend off a slide job attempt with a crossover but then checked out in the remaining 3 laps to grab our 3rd win of the season!! The fans explained over and over how incredible the race as to watch. It was amazing to come out on top of a race that had the fans so involved. My crew and I have been working very very hard over the past year or so doing our best to make these cars faster and more comfortable for me. I cant say we have reached that point yet but I do know I am more confident with our setups week in and week out. On Saturday, Port Royal had a $4000 to win show that ran throughout the night with the USAC wingless cars during their tour of Eastern Storm. Because of the size of the track, the clean air is very valuable to our winged sprint cars. 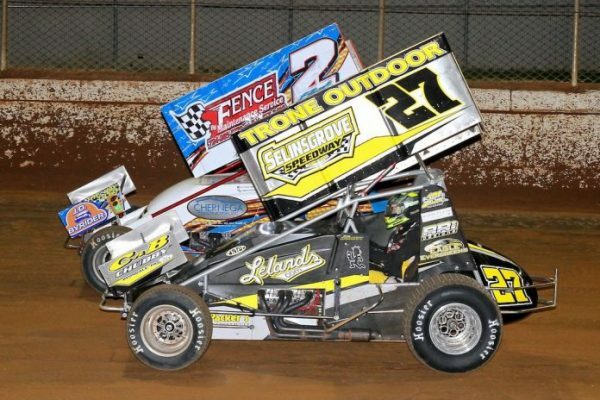 Port Royal officials know this and have been working towards creating a format that will benefit drivers who draw bad pills weekly, such as myself and my luck. This new format consists of a 6 lap heat race, a full starting lineup inversion, then another 6 laps. Passing points and finishing points are all accounted for when the final feature line up is determined. The concept is very similar to dirt karting as I was growing up. I started 9th of 10 in the first portion of the Heat Race #1 and drove up to 4th. With the inversion, I was on the front row for the 2nd portion. With open air, we dominated and won that heat. My passing points total was good enough to line me up 2nd, along side Greg Hodnett, for the A-main. Hodnett got a slight jump advantage and took off in the lead. I drove under him down the back stretch but, ultimately, he held me off and I settled for 2nd. We ran 2nd behind him for about 8 laps until a caution. During another restart, I made a second attempt to get under Greg on a restart but the car washed up and I fell to 4th. At this point, we had a red flag. I went to turn the car off but i couldnt get the fuel cleared out of my exhaust. In turn, it created a small excess alcohol fire and burnt through my LR tire. heartbroken, we were forced to pit. Restarting dead last, we drove up to 10th until NASTY red flag accident at lap 23. While trying to miss that wreck, we caught a piece of debris that put a small hole in the RR tire. By the time the accident was cleaned up, the tire was flat and I needed to pit again. When all was said an done, we finished 12th. A performance that did not show how fantastic we truly were on this night. Nonetheless, we know how racing goes. 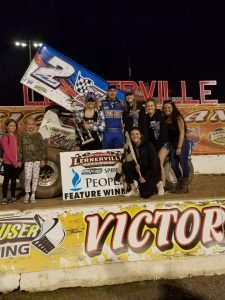 You can win on Friday and feel like you’re on Cloud 9 and then Lady Luck can rip your heart out on Saturday while racing wheel to wheel with the best sprint car drivers in the world. The race was televised and I know we showed a lot of people what our team is capable of if we finally start catching some of the right breaks.